« Treat That Special Someone To A Romantic Woodstock Getaway! Braeburn Siberians offer a variety of dog sled tours every year, December through March. Choose from a simple, 30 minute ride or a longer, 2-hour excursion. Whichever you choose, your Vermont dogsledding tour will take place in a double-driver tour sled. Each sled can carry 2 adult passengers, one sitting and one standing, not including the driver. 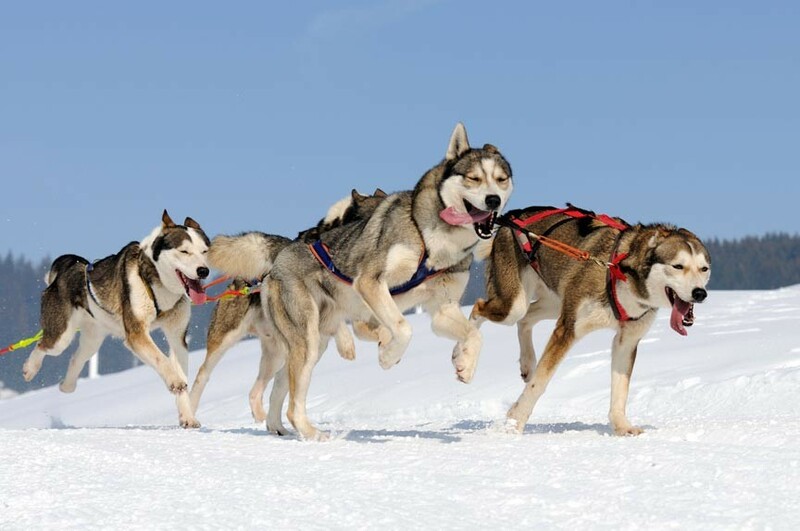 While the sitting passenger can enjoy the view and the ride, the standing passenger can take a turn at “mushing” the dogs! A professional driver will be in charge at all times, though, so don’t be nervous. And yes, you can certainly take turns standing and sitting. These dog sled tours typically go out with two to three sleds, so if your group is larger than two, you can still all go together. If you enjoy dogs, snow, and the beauty of the great outdoors, you owe it to yourself to experience a Vermont dog sledding adventure. Deer Brook Inn would love to serve as a home away from home for all your Vermont adventures. The Woodstock area is an excellent central location for skiing, shopping, sightseeing, hiking, biking, and much more. We offer four comfortable and welcoming guest rooms and suites with en suite bathrooms. Breakfast at our Vermont B&B is a culinary celebration of fresh and local dishes made from scratch. Come experience the good life at Deer Brook Inn!